I received my happy mail a couple days ago and wanted to try them out. Thought I'd start with MFT 's Count The Stars. 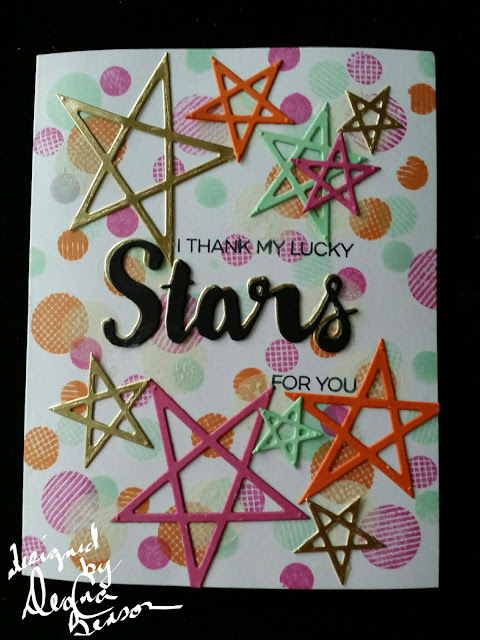 I got out some Neenah Solar White cardstock and made my card base, then using the MFT Bokeh Builder and Simon Says Stamp ink (doll pink, mint, orange peel) I made my background. Taking some card stock from a Simon Says Stamp card kit and a piece of gold, I die cut it using MFT'S Lucky Stars and Stars and Wishes. The word stars is layered on gold and the sentiment is stamped in Memento Tuxedo Black ink.